Kobu gets to open his first Christmas present with his foster family. Kobu has never known what Christmas was. Back in Taiwan, Kobu lived on the streets in a country that isn’t exactly known for having the best track record when it comes to animal rights. He was rescued from there and brought into Canada. Here, his foster family is showing him what the holiday is all about……PRESENTS!!!!!! Merry Christmas Kobu. Now he just has to decide whether to play with the toy or shred the giftwrapping paper. Though I would *not* teach nor allow my dog to open presents like that. It allows for a lot of mischief. Patricia Cheney Barber what are your two rescue dogs getting? Marrow bones, Daryl Cheney White! Also, Chico came with a prezzie from his foster family. That’s a great story. Thanks, Missy! Um…. he’s a dog….. he still doesn’t know what christmas is…. 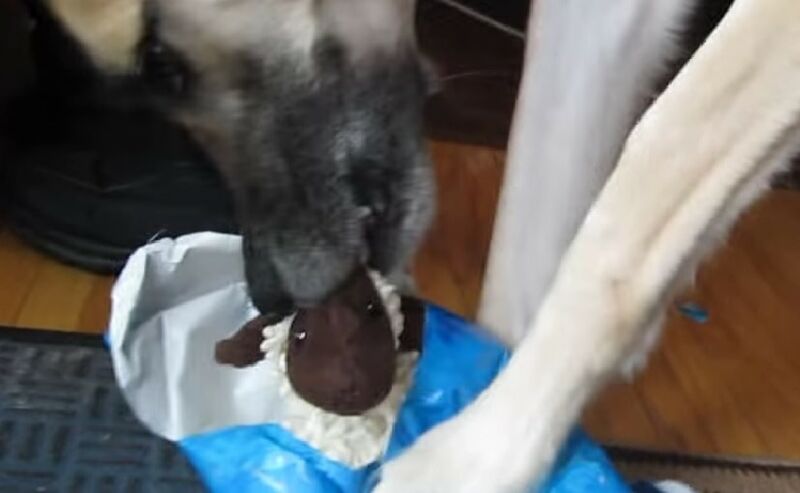 How much fun is it to unwrap a good stuffie! Awww!! He’s so gentle opening his gift!! That’s exactly what I said, Cheryl…lucky boy and luckier family. Merry Christmas Kobu! I loved the…”No mom, I can do this by myself” moment very sweet…Merry Christmas Kobu! tnx to the great, kind person..
Aww, cute when he shakes off the wrapping! I just love it!!!! Merry Christmas, Kobu!! Only good days ahead for you! perfect! i wish my pup was as good at opening his presents!